Most of the Multimedia Interactive Learning Applications (MILAs) available on this site load MILA Content Cartridges (MILA CCs) of text, images, audio, and animations to generate learning activities. Content Cartridges provide the content for MILAs to generate word searches, hangman games, gapfill exercises, keyword sentence transformations, c-tests, dictation activities, matching activities, reading and listening activities, phonetic charts, pronunciation activities, etc. You can mix and match MILAs with MILA CCs quickly and easily to deploy a wide range of multimedia interactive learning games, exercises, and activities. What are MILA Content Cartridges? MILA Content Cartridges contain everything MILAs need to generate learning activities. Typically, they come loaded with images, audio, text transcriptions, questions, answers, and keyword lists. They’re open format which means that you can go into the cartridges and see all the individual image, audio, and text files if you wish. You can also edit them with any suitable image, audio, and text editors, of which there are many free and open source options available. 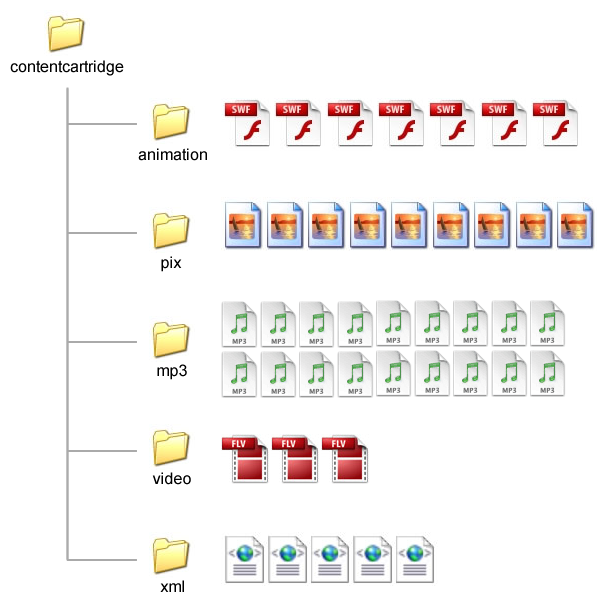 animation: Files containing short animations, usually in Flash format, that can also be interactive and contain other media such as images, text, audio, screen recordings, and video. pix: Image files in JPG, GIF, and/or PNG formats. They can be digital photos, icons, rendered text, scanned images, or other graphics. mp3: Audio files in MP3, AAC, F4A, F4B (audio book), and/or WAV formats. WAV format is a typically large file format and requires specially adapted media players and so is not recommended for web use. video: Video files in FLV, F4V, MOV, MP4, and/or M4V formats. xml: Human readable data files in open text format. They contain collated information of questions, answers, keywords, gapfill exercises, phonetics, etc. as well as links to the files in the /animation/, /pix/, /mp3/, /video/ directories. You only need a text editor, such as Notepad++, to read and edit XML files. Formats are typically SMIL, MPEG-7 or custom XML. MILA CCs aren’t only for use with MILAs. They are libraries of reusable media content that learners, teachers and course content developers can use in lessons and presentations, web pages, forums, glossaries, assignments, wikis, and quizzes. Additionally, some MILA CCs include exported Moodle Glossary Module data that can be imported to deploy talking picture dictionaries in Moodle courses. The images, audio, video and animations can also be used by teachers and learners as ad-hoc resource libraries for learning activities. The open and accessible design of Content Cartridges means that anyone with the time and resources can create their own. If you’re interested in creating and licensing Content Cartridges, I’d love to hear from you and help you with any questions you may have about creating, distributing, and promoting them. What Content Cartridges are available? Phonetics: An extensive set of items with over 600 rendered words and over 900 audio recordings. Can be used both with the International Phonemic Alphabet MILA and with other MILAs. If you have particular need of any of the Content Cartridges listed but not yet completed or a different title altogether, please let me know so that I can prioritise them or make up a new set. Please note that creating a new MILA Content Cartridge can take several days to complete. How can I buy licences for MILA Content Cartridges? If you’re interested in licensing MILA CCs send Matt Bury an email. You do not need to buy any MILA licences to buy MILA CC licences. MILA CCs can be used on content management systems (e.g. Drupal, Joomla, Mambo, MediaWiki, phpBB, or WordPress) and learning management systems (e.g. aTutor, ILIAS, Moodle, or Sakai) as long as only registered, logged on users can view them and they cannot be indexed by search engines. Can I see an example MILA Content Cartridge? Yes, of course. I’ve created a starter MILA Content Cartridge and licensed it under the Creative Commons Share-a-like licence. This means you can use, edit, copy, and redistribute it freely under the conditions of the Creative Commons licence.